Welcome to the second Songs of the Week of 2019. This week's list includes tracks from freshly announced albums (Strand of Oaks, The Drums, Tamaryn, C Duncan, Glen Hansard), as well as by artists who have already made this list with previous songs from their upcoming albums (Telekinesis, Piroshka, Cass McCombs). It was a strong week for new tracks. Elsewhere on the website this week we posted an interview with We Were Promised Jetpacks, an in-depth 10,000 word interview with The Twilight Sad, and Artist Survey interviews with Mass Gothic and The Beths. 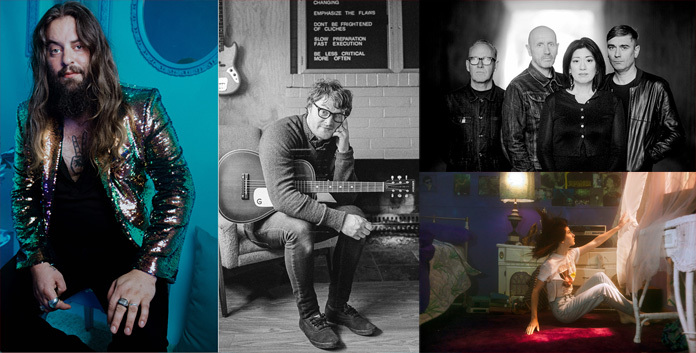 In the last week we also reviewed a bunch of albums, including the latest by Steve Mason, Tallies, Steve Gunn, The Chills, The Twilight Sad, and Sharon Van Etten. Plus we posted reviews of various DVDs, Blu-rays, films, and TV shows, including the latest episode of The Good Place. 1. Strand of Oaks: "Weird Ways"
This week Strand of Oaks (the project of Timothy Showalter) announced a new album, Eraserland, and shared its first single, and opening track, "Weird Ways." Eraserland is due out March 22 via Dead Oceans. The majority of My Morning Jacket (Carl Broemel, Bo Koster, Patrick Hallahan, and Tom Blankenship) back-up Showalter on Eraserland, which also features Jason Isbell and Emma Ruth Rundle. "Weird Ways" definitely sounds like a pleasing hybrid between Strand of Oaks and My Morning Jacket, with perhaps a bit of The War on Drugs' bossgaze vibe mixed in. Strand of Oaks have also announced some tour dates, check them out, as well as the album's tracklist and cover art, here. Eraserland is the follow-up to 2017's Hard Love. Kevin Ratterman produced the album, which was recorded at La La Land Studios in Louisville, KY. A press release sets the stage for the album: "Empty and determined that he would never write songs again, dark thoughts crept in and Showalter, concerned for his own well-being decided to go on a spiritual pilgrimage - to the Jersey Shore." His friends in My Morning Jacket, especially Carl Broemel, heard Showalter was in a bad way and offered their assistance in recording the next Strand of Oaks album, that they could be his backing band. So Showalter got to writing and demoing the new album in February 2017, alone in Wildwood, NJ. Then the album was recorded in Louisville in April 2017. "This project seemed to just fall together naturally," says Broemel in a press release. "I felt drawn to Tim's positive energy and his albums...I threw it out there that I'd be happy to help in any way I could with the record." My Morning Jacket's Patrick Hallahan adds: "I remember sitting next to Tim and Kevin listening to the final mixes with tears rolling down my cheeks. From start to finish, this one came from the heart." A press release calls "Forever Chords" the definitive track on Eraserland, saying the song is "the manifestation of everything he hoped to achieve on this record and for Strand of Oaks as a whole." Showalter adds: "When I finished writing 'Forever Chords,' I felt like this is either the last song I ever need to write, or the rebirth of Strand of Oaks." Hopefully it's resulted in the latter. It seems as much. Read our review of Hard Love. 2. Telekinesis: "Cut the Quick"
Telekinesis (the project of Seattle-based singer/songwriter/drummer Michael Benjamin Lerner) is releasing a new album, Effluxion, on February 22 via Merge. Previously he shared a lyric video for its first single, "Set a Course" (which was one of our Songs of the Week). This week he shared another song from the album, "Cut the Quick," via a video for the song. Kayhl Cooper directed the video, which was filmed in Manhattan and features Lerner being haunted by a mysterious spirit living in a photograph. Effluxion is Telekinesis' fifth album, the follow-up to 2015's Ad Infinitum. Effluxion comes from the Latin term meaning "to flow." While on previous albums he worked with Death Cab for Cutie's Chris Walla and Spoon's Jim Eno as producers, Lerner self-produced Effluxion, recording it in his basement home studio and playing every instrument. The album was influenced by his time in 2017 as a touring member of Teenage Fanclub, leading him to a more back-to-basics sound as opposed to the drum machine-led Ad Infinitum. Also, read our 2015 interview with Telekinesis or our 2015 Artist Survey interview with Telekinesis or our 2014 Artist Survey interview with Telekinesis or Lerner's My Favorite Thing post on Flin Flon's A-Ok or our Halloween 2013 Questionnaire with Lerner or the guest post he wrote on the film The Sandlot. This week Weyes Blood (aka Natalie Mering) shared a brand new song, "Andromeda." Right now it's just a standalone single on her new label Sub Pop, but it's expected to also be found on her next album, reportedly due out this spring. Weyes Blood's last album, Front Row Seat to Earth, made it all the way to #9 on our Top 100 Albums of 2016 list. Read our interview with Weyes Blood on Front Row Seat to Earth (from our Best of 2016 Issue). Also read our The End interview with Weyes Blood about endings and death. Piroshka are releasing their debut album, Brickbat, on February 15 via Bella Union. Previously they shared the album's first single, "Everlasting Yours" (which was one of our Songs of the Week), as well as a video for the song. This week they shared another track from the album, the politically fueled "What's Next?" Piroshka features members of various other iconic British acts. They are fronted by former Lush singer Miki Berenyi (vocals/guitar) and also include former Moose guitarist KJ "Moose" McKillop, Modern English bassist Mick Conroy, and former Elastica drummer Justin Welch. "'What's Next' started life as a guitar-and-drums demo from Justin that he'd called 'Protest' - the drums being inspired by the idea of a protest march. It's one of the very first songs Piroshka worked on together. The lyrics are inspired by the shock and fallout regarding current political upheavals - how this finger-pointing and rage and blame are so damaging, how we need to get back some kind of solidarity if we possibly can because the divisions between us are playing into certain people's hands. Funnily enough, the song was called Time's Up when it was first recorded, but that title then got taken so we thought we'd better change it! It's the only track on the album mixed by Alan Moulder - before we got picked up by Bella Union, we had an album's worth of demos but we only had enough money to get one of them mixed!" Lush reformed in 2015, with Welch filling in for the late Chris Acland on drums. The band released one great comeback EP in 2016, Blind Spot. When bassist Philip King left the band later that year, Conroy filled in on bass for Lush's final shows before the band broke up again after those shows. It was Welch who suggested forming a new band with Berenyi and Conroy. McKillop is Berenyi's partner and has two children with her and naturally found a place in Piroshka. Both Lush and Moose were leading lights in the early 1990s shoegazing scene. "We sounded great!" said Welch, in a previous press release, of their initial Lush rehearsals with Conroy. "Like a proper punk band. Mick brings a huge amount of enthusiasm and livens up the room, and I thought, this is the kind of band I want to be in again." Conroy added: "I'd seen Lush so many times, it was like playing with old friends. Miki agreed it was good fun too. And with Moose available we thought, let's all have a bash, see what happens." It was not a given that Berenyi would be interested in joining a new band. After Lush's split in 1998 she had stepped away from performing music, focusing on raising her kids and working for magazines. "After the Manchester show, Justin asked if I'd be up for something else," Berenyi explained in the press release. "But I'd never made music outside of Lush, and I've never wanted to do anything solo. I need someone else to motivate me, and in this case it was Justin. He sent drum tracks with guitar parts and odd words, so I wrote some vocals and lyrics, which became 'This Must Be Bedlam' and 'Never Enough.' When Mick added bass, it sounded great. When Moose added guitar and keyboards - I'd never written like that before, it was such good fun." Read out 2016 interview with Lush on their reunion and Blind Spot. Also read our two 2015 interviews with Berenyi and Lush bandmate Emma Anderson on their albums Split and Lovelife, in which they discussed the challenges of reforming. Also read our 2007 interview with Berenyi, which at the time was her first interview in a decade, since Lush's breakup. 5. The Drums: "Body Chemistry"
This week The Drums (aka Jonny Pierce) announced a new album, Brutalism, and shared its first single, "Body Chemistry." Brutalism is due out April 5 via ANTI-. Check out the album's tracklist and cover art, as well as The Drums' upcoming tour dates, here. The album is the follow-up to 2017's "Abysmal Thoughts" (the quote marks are part of the title), which was the first Drums album that was essentially a Pierce solo project. Pierce had this to say about " Body Chemistry" in a press release: "For the year prior to writing this song, I had been dealing with an increased feeling of depression. To counter that, I was doing all I could do to try and make myself feel good: implementing all sorts of self-care, going to therapy, eating well, exercising at the gym, taking a step back from partying, and focusing on positive relationships while weeding out the not-so-good ones. I still found myself weighed down with anxiety and depression. This song asks the question: Is this dull, sad feeling in my DNA? Is it part of my gene pool? Can it ever be corrected? I had been confronting some of my most stubborn demons, and I came to realize that confronting doesn't always mean conquering." Brutalism was written and recorded between Upstate New York and a studio in Stinson Beach, just north of San Francisco. A press release states: "Following a painful divorce and an incredibly difficult stint living solely in Los Angeles, Pierce decided it was time to face his demons, and the making of this record is a part of that process." Pierce further explains: "I was exhausted, depleted and sabotaging myself, partying so much but in reality running away from pain. It was a downward spiral." And so Pierce went to therapy. "It was do or die," he says. The press release says that Pierce is now "working towards a better, healthier headspace." "I don't think I'll ever really find myself," he says. "I don't think people do. I don't think there's a day that you wake up and you go, 'Now I know who I am.' The best way for me to be an artist is by taking a goddamn minute, being still, and listening to what it is that I want and need." Read our 2017 Protest interview with The Drums' Jonny Pierce. 6. Cass McCombs: "The Great Pixley Train Robbery"
Cass McCombs is releasing a new album, Tip of the Sphere, on February 8 via ANTI-. This week he shared another song from it, "The Great Pixley Train Robbery." According to a press release the song is "based on a newspaper article McCombs uncovered from the 1800s." The song was shared via a video featuring stock footage of trains from various movies. Previously McCombs shared the album's first single, "Sleeping Volcanoes" (which was one of our Songs of the Week). Then he shared another song from the album, "Estrella." He also did A Take Away Show for La Blogotheque that was filmed at the Dutch National Railway Museum when McCombs was in Utrecht playing the Le Guess Who? Festival in November and featured performances of both "Sleeping Volcanoes" and "Estrella." The album is the follow-up to 2016's Mangy Love, which made Under the Radar's Top 100 Albums of 2016 list. McCombs traditionally records his albums in bits and pieces in different studios over time, but took a different approach with Tip of the Sphere, recording the whole thing quickly in one location: Shahzad Ismaily's Figure 8 Studios in Brooklyn. A press release says this new approach "brought his songs a raw immediacy and a special balance of compassion and experimentation with the intent of making a more consistent statement." Sam Owens (aka Sam Evian) engineered the album, which features McCombs on guitar and vocals, as well as Dan Horne (bass), Otto Hauser (drums), and Frank LoCrasto (piano, organ, and more), as well as some guests. Also read our 2016 interview with Cass McCombs. 7. Tamaryn: "Fits of Rage"
This week Tamaryn announced a new album, Dreaming the Dark, and shared its first single, "Fits of Rage." Dreaming the Dark is due out March 22. Check out the album's tracklist and cover art, as well as her upcoming tour dates, here. 8. James Blake: "Lullaby For My Insomniac"
James Blake released a new album, Assume Form, today via Republic. This week Blake shared two songs from the album: "Mile High" (which features Travis Scott and Metro Boomin) and the album's haunting closing track, "Lullaby For My Insomniac." It's the latter that makes our Songs of the Week list. The album was only just announced last week and when it was announced no new music from it was shared (although the album does include the previously shared single "Don't Miss It"). Assume Form also features André 3000, Moses Sumney, and ROSALÍA. Blake's last album was 2016's The Colour In Anything. Back in May 2017 he shared a lyric video for "Don't Miss It" (which was one of our Songs of the Week). It followed "If the Car Beside You Moves Ahead," another new song Blake shared back in January 2017 (via a video for the song), which is not featured on the album. Earlier today, Scotland's C Duncan (aka Chris Duncan) announced a new album, Health, and shared its first single, "Impossible." Health is Duncan's third album and is due out March 29 via FatCat. It was produced by Elbow's Craig Potter. Check out the album's tracklist and cover art here. Health follows 2015's Mercury Prize-nominated debut, Architect, and 2016's Twilight Zone-inspired sophomore album, The Midnight Sun. His first two albums were bedroom-recorded affairs, this is the first album recorded with other producers, engineers, and musicians. "This was the biggest shift in dynamic for me," Duncan says in a press release, "having always worked alone, it was a daunting prospect but one I knew I had to explore." "Impossible" is about the challenges Duncan had making a long distant relationship with an ex-boyfriend work. Duncan explains in the press release: "At one point he was working night shifts, so it was very hard to communicate with each other because our schedules were completely out of sync. I wanted to see him all of the time, but it was impossible to do at that point in time." Duncan also had this to say about the album in a press release: "With album three, I wanted to take a more direct approach, adding even more layers but thematically and lyrically laid bare. Having someone else to bounce production ideas off was really eye-opening for me. In the past, I had been very controlling about how everything would sound but Health really showed me the benefit of working with others and made the whole process much less isolating." Read C Duncan's article for us on his favorite Twilight Zone episodes. Read our interview with C Duncan on Architect. 10. Glen Hansard: "I'll Be You, Be Me"
This week Glen Hansard has announced a new album, This Wild Willing, and shared its first single, "I'll Be You, Be Me." This Wild Willing is due out April 12 via ANTI-. "I'll Be You, Be Me" has a bit more swagger than some Hansard tracks, it has a bit of Leonard Cohen vibe to it as well, as the song swells to include strings and a backing choir at the end. Check out the album's tracklist and cover art, as well as Hansard's upcoming tour dates, here. This Wild Willing was "conceived in Paris" and recorded at Black Box studios with producer David Odlum. The album also features classically-trained Iranian musicians the Khoshravesh brothers, long-time Hansard associates Joe Doyle (bass) and ROMY (piano, vocals, string arrangements), and Dublin electronic musicians Deasy and Dunk Murphy (Sunken Foal). Hansard, of course, is also in The Frames and The Swell Season and, alongside Markéta Irglová, won an Academy Award for Best Song for "Falling Slowly" from the film Once that Hansard and Irglová both starred in. Hansard had this to say about the album in a press release: "This collection of songs is mainly made up of those that came through while improvising and following the melodic lines and threads. Sometimes when you take a small musical fragment and you care for it, follow it and build it up slowly, it can become a thing of wonder." These seven songs almost made the Top 10. Wild Nothing came closest to making the main list, followed by Karen O and Danger Mouse. Mike Krol: "What's the Rhythm?" Methyl Ethel: "Trip the Mains"
Karen O and Danger Mouse: "Woman"
And the Kids: "No Way Sit Back"
Bis: "Sound of a Heartbreak"
The Cranberries: "All Over Now"
The Killers: "Land of the Free"
Sir Babygirl: "Everyone is a Bad Friend"
Xiu Xiu: "Pumpkin Attack on Mommy and Daddy"